I am obsessed with Fish Tacos. Like a surfer who is eternally chasing the perfect wave, I feel compelled to top my last experience, no matter how satisfying it was. I am not the only one caught in the grip of a Fish Taco fixation. The editors of Fish Taco Magazine “scour the planet” for the ultimate handful of perfection. So far they have scoured parts of Texas, Utah, Hawaii, Mexico and California. Since fish tacos are composed of only a half-dozen ingredients, freshness is essential. But the key to perfection is balance. The crispy coating on the fish gives way to its soft warm interior, the chewy yet pliable corn tortillas encase cool, crunchy cabbage, topped by the heat of a piquant pico de gallo, tempered by a squeeze of creamy sauce, mediated by a spritz of lime juice. Tacos (or tortilla wrapped food) have been a mainstay of Mexican cuisine since before the arrival of Europeans. Generally eaten in the morning or evening (since lunch is traditionally the big sit-down repast of the day) they are convenient, self-contained meals often sold in stands, trucks and carts. Two towns on opposite coasts of the skinny Baja peninsula claim to be the birthplace of the fish taco, Ensenada and San Felipe. 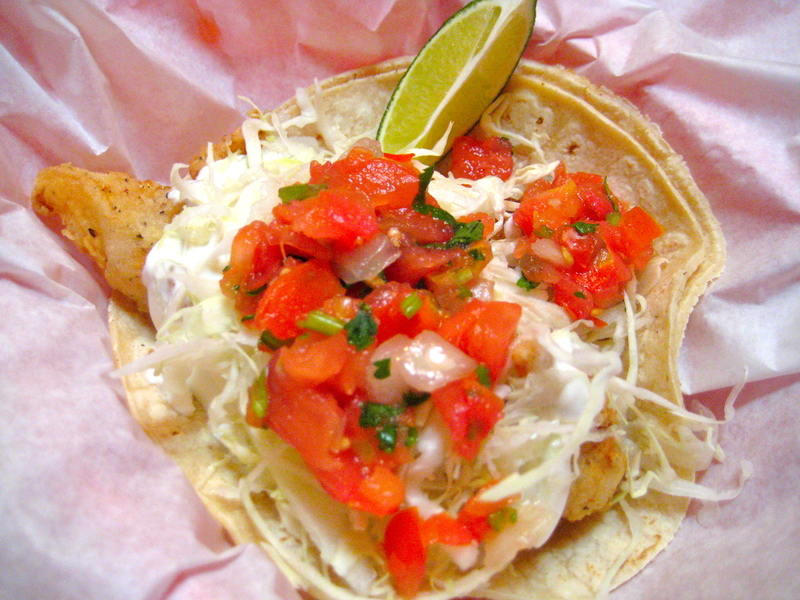 Their common characteristic is that they are each on the water, since a mild white fish is the heart of the fish taco. In my quest to find the East Bay’s perfect fish taco, it is clear that there are several contenders, each with a distinct personality. I choose which fish taco to spend the evening with, as I might choose which one of my friends to hang out with, depending on my mood. Fish taco - Baja, Piedmont Ave. This colorful storefront, opened 18 years ago by a surfer/dentist, claims to have served the East Bay’s first fish tacos. Their generous baton of fish lies on two large tortillas with a mound of cabbage, bright salsa fresca and sour cream. Satisfying and dependable like a trusted pal that you can always count on (even if he might repeat the same old stories). Fish tacos at Mariscos Sinaloa, International Blvd. A completely different experience, like visiting an edgy friend in a sketchy part of town, who is not going to bother to dress up for you, but is as authentic as they get. Two big silver taco trucks grace the corner of International and 22nd St. The one in the back decorated with painted swordfish and a long line of patrons does the fish. For $1.50 you get a griddled tortilla, topped with chopped battered fish, and a lusty salsa. For crunch, it’s DIY radish chunks on the side. 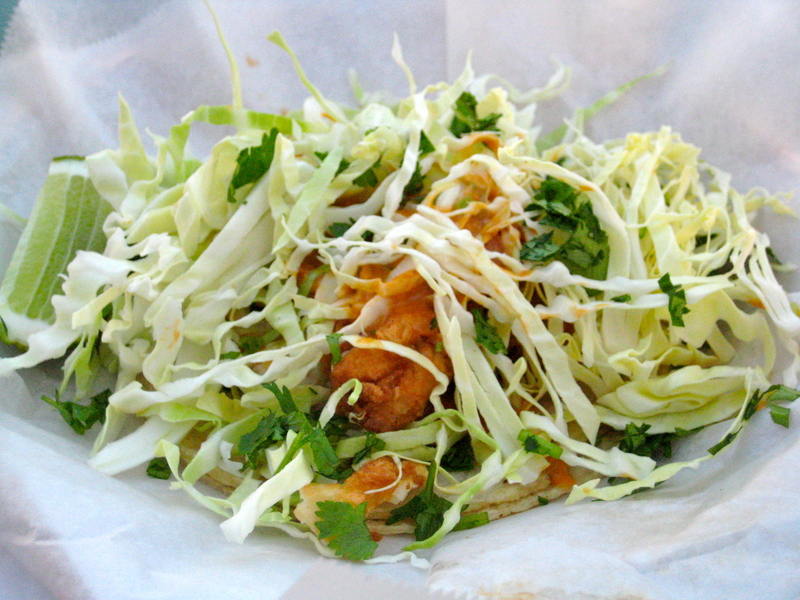 The fish taco at this popular Fourth Street spot features battered, fried pollack buried under a pile of cabbage and cilantro. It’s the smoky chile arbol aioli that provides the air of mystery and keeps me coming back. Like an intriguing friend that keeps you guessing, it is always just unpredictable enough to keep the relationship interesting. So, what do you think? Got another fish taco to add to my support system? 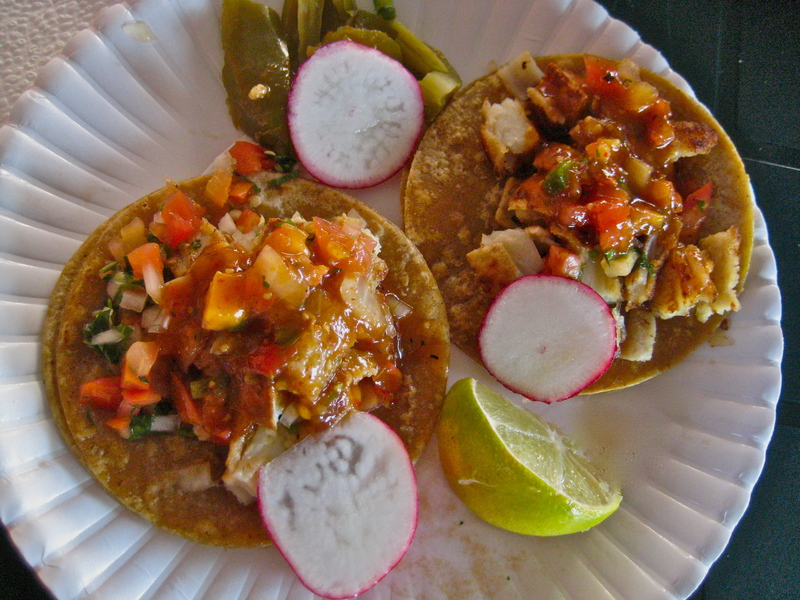 This entry was posted in Mexican food and tagged Baja, Fish tacos, Mariscos Sinaloa, Tacubaya. Bookmark the permalink. Once I found Tacubaya’s fish taco, I stopped looking. They are divine! I love these pictures. They make my mouth water! Thank you so much. I am still working on my photography skills.